" Bali can be seen in Lombok, but Lombok cannot be seen in Bali "
Such is the cliché in a brochure advertising Lombok as a tourist destination. That is not without reason. In the western part of the island, Hinduism is heavily present alongside Islam. The island was Javanese prior to the Islamisation of Java, and as such subjected to the powerful influence of the Shiva Buddhist tradition from Java. In the 17th century, the King of Karangasem invaded Lombok, turning into an important center of Hindu - Baliness power and culture. Such influences inter - wine history of Bali and Lombok.The Balinese still makes up an important minority in the western part of the island. The city of Cakranegara is a mainly Balinese city. The Pura Meru Temple, built by Anak Agung Karang in 1720, is dedicated to the Hindu trinity of Brahma, Wisnu, and Shiwa. Another sign of the effect of Karangasem is the famed Taman Namada, built 1727 by Anak Agung Gde Ngurah Karangasem as both a recreational garden and a place to Shiwa. But despite the Hindu influence, Lombok is essentially a Muslim island. Islam come first from Java, and then from Sulawesi, whose sea - faring Bugis set up the eastern Kingdom of Selaparang in the 17th century. So the religious mix is remarkably complex. Most of the Sasak people of Lombok follow a brand of Islamic orthodoxy professed by traditional teacher, which is known as "Tuan Guru". Other follow the syncretism tradition of ' Watu Telu". Instead of praying five times a day as Moslem usually do, they prey only three times a days, and have a cosmology influenced by Hinduism. There is even a temple in Lingsar where people from Hindu and Islamic traditional meet for common prayer. 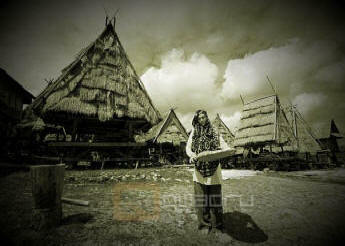 Besides the Balinese and Sasak, there are also Bugis in Lombok Island. The Lesser Sunda is lands region, of which Lombok but apart, cover and area as wide as Java. It has great variety of ethnic groups, with an increased Melanesia influence the further one goes east. There is at least 33 main language. Some islands are highly Islamic (like Lombok and Sumbawa), while other mostly catholic (Flores) and still other are Protestant, (Sumba, Rote, and western Timor). The area is no less varied geographically. The Nusa Tenggara islands are the most varied in Indonesia: their landscape ranges from Lombok's volcanoes to Sumba's and Flores' dry Savannah. There are also colorful atolls in many part of the region..
Lombok is where the transition towards eastern Indonesia begins, both naturally and culturally. The northern part of Lombok is mountainous and verdant with tall trees and shrubs covering the land. One finds none of the large Asian mammals. The western part of the island is the greenest and most humid. As one moves east, the dry season become more pronounced, and in many areas corn and sago instead of rice, are the staple foods. 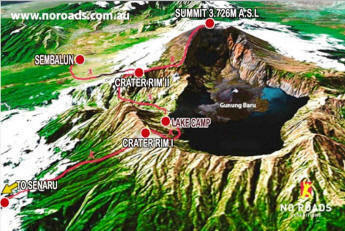 Lombok Principal Mountain is the 3726-m Rinjani Mountain, third highest in Indonesia. Still active, it lasts erupted in 1901, 1994 and 2004. Mountains play an important role in sasak tradition. Both the Sasak and Balinese people have a yearly pilgrimage to Rinjani's summit, which has several sulfuric lakes with curative virtues. 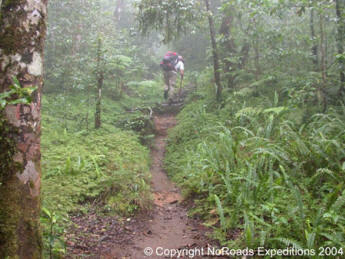 Mountain Rinjani also offers trekking through the rain forests. Mataram the capital of west Nusa Tenggara, altogether with Ampenan, the old port, and Cakranegara, the old Balinese capital, make up the largest urban area in the province. Nearby Sweta has the largest tradition market including birds. Very different from the atmosphere of urban Lombok is a traditional village such as Sukarara; famous of the weaving, and Penujak, Banyu Mulek; famous for its pottery. Lombok has large array of beautiful beach. Kuta beach (also known as Putri nyale beach), it on the south coast of Central Lombok. The answer to Bali's Kuta, albeit much less developed, kuta in one of the most scenic and unspoiled beaches on the island. From Kuta to Tanjung A'An, five kilometer away, there is an unbroken stretch of clean white sand. The Sea is safe for bathing and swimming. Further to the west are several surfing and windsurfing beaches. Each year, on the 19th day of the tenth month of the sasak lunar calendar, when the Nyale fish come to the sea surface, Kuta beach host the famous Nyale festivel (Normally on February). But Lombok's chief resort is Senggigi beach, offering range of accommodation, with the best Hotel on the island situated here. Coral can be seen in abundance just offshore. Gili in the Sasak language means island. The three gili island, gili Air gili Meno and gili Trawangan, are idyllic islets just off the northern coast. A favorite with back packers, the island abounds with coral garden. Gili air the nearest island can be reached in 15 to 20 minute by boat from the main land and 1,5 hours from Senggigi. One of the best way to enjoy the splendor and beauty of the Gili island is to go on cruise by Traditional boat from Senggigi. The blue tinted stag horn corals are one of the attractions here. On Lombok, nature and you enter new geographical zone, the intermediate zone between Asia and Australia. The staple food is sago, corn, or cassava. There is little paddy, as cattle replace agriculture as the main activities of the local people. The other important economic activity is the making of pottery, which is gaining worldwide fame. Pottery is produced mainly in the village of Banyumulek, Masbagik Timur and Penujak. Here, women have been involved in this craft since the decline of the Hindu Kingdom of Majapahit in the early 16th century. Technically, there are few differences in processes used in the three villages except that the designs of the pots are different. Since 1988, the Lombok craft project, jointly run by the Government of the Republic Indonesia and of New Zealand, has been provided technical and marketing assistance to these women potters. It has assisted them to process their clays in way which produce a stronger product. The earthenware clay used is grayish brown in its natural state but becomes a beautiful rich brown when fired. Finished pots are coated with a slip made from the same clay, sieved to produce a fine surface which is later burnished with stone. The clay used to produce Sasak pottery has been approved for food safety by the New Zealand Department of Scientific and Industrial Research. Such pottery items, ranging from food storage containers to cooking utensils and water jars. Totally hand - crafted, Sasak pottery is intrinsically fragile but if handled with care will last many years. Another island in the Nusa Tenggara chain is Sumbawa, whose 2200-m Mount Tambora, erupted in the 18th century, killing most of the local population (about 30.000 people). The biggest town is Sumbawa Besar. The island is predominantly Moslem, with some Christian communities. The palace belonging to the ancient Bugis Sultan of Sumbawa, Dalam Loka can be visited. As can Bima and Sape two other interesting places. Flores means "Flower" in Portuguese, and the island which take this name is one of the main island in East Nusa Tenggara. It was a Portuguese colony for long time before the dutch took over. Many of the local people are of Portuguese descent and still retain Portuguese names. Catholicism is the main feature in the many villages of the flores and of same of the small islands nearby. Every year the Paso Easter procession in held in Larantuka, the town house of the black Madonna of Flores. This westernized island has many untouched beaches and pristine underwater coral garden. There are shark hunter villages in Lamalera and Small Island of Lambata. The mainland is famous for its tricolor Caldera Lake on Mt. Kalimutu, whose combined of colors change according to the volcanic activity. The women made ikat weaving from flores are well known amongst collectors. It has many styles as there are dialect: about 15 altogether. Between Sumbawa and Flores is Komodo and Rinca Island, a Jurassic Park of an Island, home to the Giant four meters long Komodo dragon lizard, which cam weigh up to 150 kilogram. June till September is the best months to observe this endangered prehistoric monster up close. When watching this living dinosaurs, visitor offer goats as bait to make the monster demonstrate their "beastliness". But be careful! ( There are stories of European tourists whose cameras were the only things which returned home. Unusually, the sand on this island's beach has pink hue. On each island of Nusa Tenggara, the traditional are particularly beautiful and the traditional markets unique. Apart from the larger islands of Nusa Tenggara, there are many smaller island ready to uncover their beauty and richness. They represent future challenges for the Indonesia tourism industry.